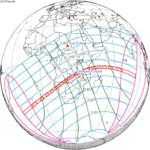 A partial solar eclipse occurred on July 1, 2011. 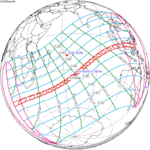 A solar eclipse occurs when the Moon passes between Earth and the Sun, thereby totally or partly obscuring the image of the Sun for a viewer on Earth. 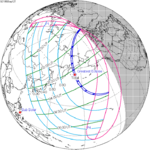 A partial solar eclipse occurs in the polar regions of the Earth when the center of the Moon's shadow misses the Earth. 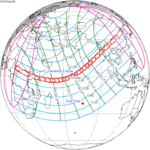 This is the first solar eclipse of Saros series 156, only visible as a partial solar eclipse in a small area south of South Africa and north of Antarctica. At greatest eclipse, the magnitude was just 0.097. 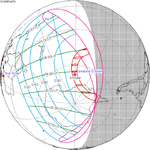 It is the first new saros series to begin since saros 155 began with the partial solar eclipse of June 17, 1928. 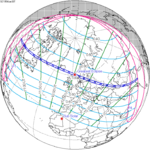 The eclipse belonged to Saros 156 and was number 1 of 69 eclipses in the series. 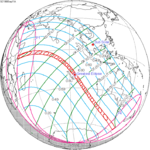 Thus, the 2011 Jul 01 event was the very first eclipse of the series. 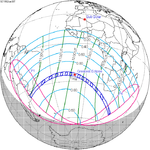 This eclipse is the third of four partial solar eclipses in 2011, with the others occurring on January 4, 2011, June 1, 2011 and November 25, 2011. 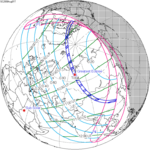 Partial solar eclipses on June 1, 2011, and November 25, 2011, occur on the next lunar year eclipse set. 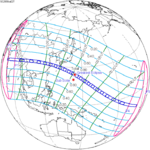 22 eclipse events between September 12, 1931 and July 1, 2011. 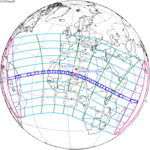 Wikimedia Commons has media related to Solar eclipse of 2011 July 1. This page was last edited on 16 February 2019, at 23:28 (UTC).